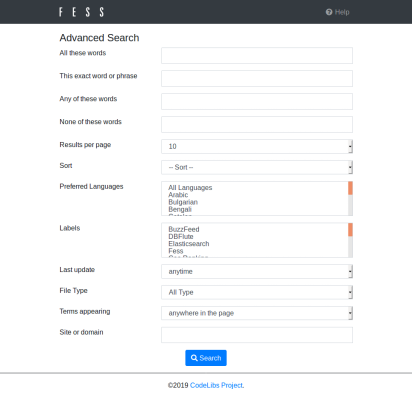 Narrow down search results for complex searches by using Advanced Search. You can access Advanced Search page by clicking Advance button in Search Options dialog. You can search by pressing Search button at the bottom of the page. All thses words provides a search result that contains all search words you type at a text box. This exact word or phrase provides a search result that contains exact word or phrase you type at a text box. Any of these words provides a search result that contains some of search words you type at a text box. None of these words provides a search result that does not contain specified search word. Change the number of documents in search result page to display them. you can select preferred language. Narrow down search results by labels you select at a pulldown. Narrow down search results by last update of documents. Narrow down search results by file type you select at a pull down. you can select the search target. Narrow down search results by site or domain you type at a text box.